Vice President Joe Biden delivered a clear message to Iran, saying Saturday the U.S. was willing to talk, but will act to isolate and pressure Tehran if it does not abandon its nuclear ambitions and support for terrorism. In a sweeping speech to international leaders and security experts here, Biden said the U.S. will strive to act preventively to avoid having to choose between the risks of war and the dangers of inaction. But he held out the option that the U.S. could take pre-emptive action against Iran if necessary to stop crisis before they start. The U.S., he said, will "continue to develop missile defenses to counter a growing Iranian capability, provided the technology is proven and it is cost-effective." At the same time, he said that if Tehran gives up its nuclear program and stops backing terrorists, there will be meaningful incentives. "We will draw upon all the elements of our power - military and diplomatic, intelligence and law enforcement, economic and cultural - to stop crises from occurring before they are in front of us," Biden told the gathering in his 25 minute address. Biden's speech laid out for the first time to an international audience the Obama administration's foreign policy tenets, and emphasized diplomacy and cooperation. He also warned allies that they will be expected to share the burdens of fighting extremists and bolstering weaker governments and poor nations. "America will do more, that's the good news," said Biden. "But the bad news is American will ask for more from our partners." His comments came a day after Larijani sternly declared that the Obama administration must admit past wrongs before there can be reconciliation. "The old carrot and stick policy must be discarded," he said, alluding to Western threats and offers of rewards to coax Iran to give up nuclear activities the West views as threatening. "This is a golden opportunity for the United States." 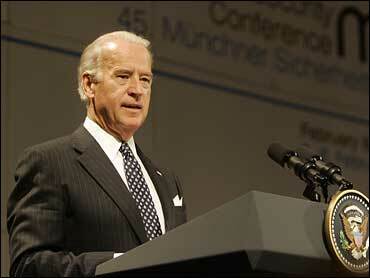 Reaching out to close another rift, Biden said it's time to repair relations between the U.S. and Russia. He said NATO and Russia should cooperate to defeat the Taliban and al Qaeda. But he warned that the U.S. will continue to have differences with Moscow, including opposition to its efforts to carve out independent states in Georgia. Biden's comments come just days after Kyrgyzstan announced it will shut down American access to the Manas air base, which the U.S. uses to resupply troops in Afghanistan. The decision came when Kyrgyzstan's president was visiting Moscow, hours after securing more than $2 billion in loans and aid from Russia. As part of his effort to spread responsibility, Biden told the leaders that the U.S. needs their help in taking the detainees now held at Guantanamo Bay, Cuba. He repeated President Obama's vow that the U.S. will adhere to its values, not torture, and will close the detention center that has spurred such criticism from European allies. But he added that allies must work together to combat extremism, and one way other nations can help is to take responsibility for some of the suspected terrorists at Guantanamo.